Iain Haley Pollock’s Ghost, Like a Place performs existential magic, revealing the constitutive activity of ghosts in the present. That paradox of present absence dissolves the conventional division between past and present, and it also drives the poetics of the book. Therein ghosts are not resurgent markers of the past, but rather animate agents of the present. Importantly, Haley Pollock is not performing some sort of archaeological excavation, whereby one might dig chronologically backward through layers of past violences. Rather, the poem operates as an epiphanic reckoning of the contemporaneity and agency of all of those moments in the present. The dead boys, the “teeth of glass” of demolished homes, and the “Indian bones” from the genocide of indigenous peoples combine elementally into the ongoing, lived mosaic of present experience. Perhaps this is one way to understand Haley Pollock’s assertion in the poem “The Properties of Solid Phase Materials” that “any absence—the dash out / for milk, the walk to the mailbox—carries / the threat of permanence.” What is vanished persists inexorably in embodied experience. Moreover, any recognition of that experiential truth spasms linear time. This is especially clear in Haley Pollock’s reexaminations of the afterlife of atrocities, which gape in the present as constitutive, pulsating voids. For example, via Haley Pollock’s poetics, the murder of Emmett Till is a relentlessly agonizing present absence. His ghost is like a place, through and around which life courses, contributing to the landscape of present experience. How, then, the book asks, is one to live with her growing awareness of such consubstantiating, irresolvable voids, especially when they so often emanate intransigent pain and anguish, like the present absence of a little boy brutally murdered by racists in 1955? To quote the title of another poem in the book, how are people to live with these indelible “Constellations of Our Own Making?” How to endure their searing agony? Instead, as that poem goes on to explain, the best that one can hope for is to voice the agony of living with and through present absences. from carrying on their creased plane that final weight. In other words, one lives the agonies of present absence by wailing sorely the pain of living loss. 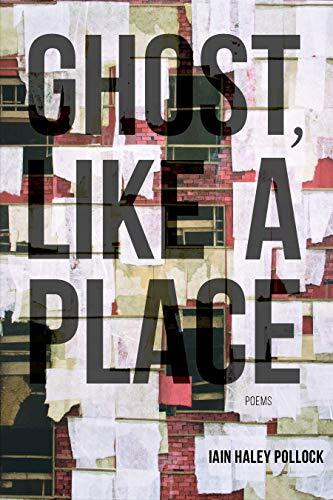 Nevertheless, Ghost, Like a Place is not an oppressively bleak book. To the contrary, it delights frequently with eruptions of extraordinary tenderness, intimacy, and beauty. This is true of even the most pained poems, like “Indian & Colored Burial Ground,” which comprises a eulogy for the speaker’s Uncle Keith and convokes a diversity of forms of racialized and economic discrimination and despair. Besides being an extraordinarily pretty, if wistful, natural image, the passage yet again reveals the transhistorical present. That is, the reader experiences concomitantly the present absences of Uncle Keith, the lost petals, the churned soil, and the melancholy of the nephew, just now speaking his losses into active presence through his poem. From that recognition of the constitutive activity of absence in life, the speaker learns his new ontology. Accordingly, he concludes the poem by intoning “I was glad, in the morning, / when I woke up alive.” And his gratitude for existing, even in the face of staggering suffering and violence, is not to be overlooked. Neither is this gorgeous collection of complex poetry. Seth Michelson is a multiple award-winning poet, translator and professor. He is author of the poetry collection Eyes Like Broken Windows and his most recently translated book is the poetry collection Wings by Israeli poet Amir Or. He teaches at Washington and Lee University where he directs the Center for Poetry Research.